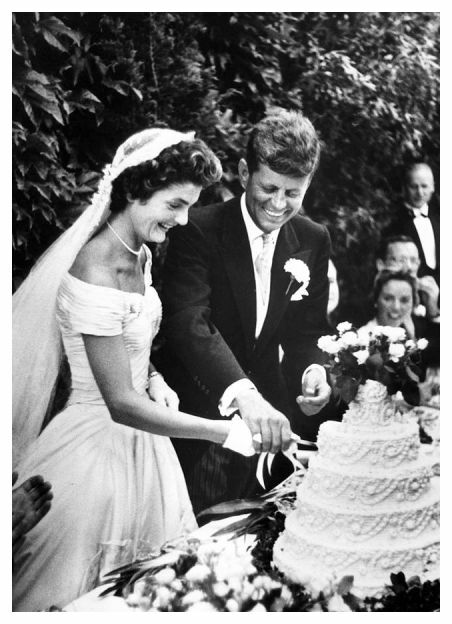 Although she does not fit into my favorite decades of the late 19th & early 20th century, there is no doubt that Jackie’s bridal ensemble was iconic. Even though she wasn’t a fan of her dress and would have preferred a gown with simpler lines, her gown is definitely a garment to admire. 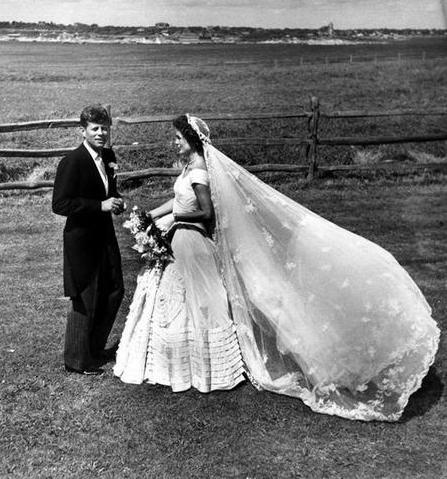 Jackie’s wedding gown was designed by Anne Lowe and created to go with Jackie’s grandmother’s wedding veil. 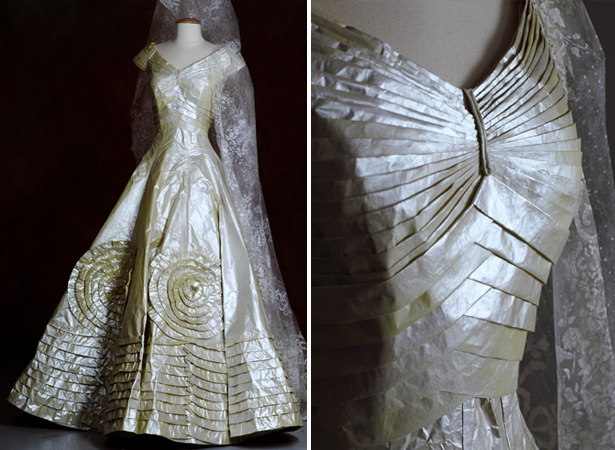 It was made of over fifty yards of ivory silk chiffon taffeta and featured a portrait neckline, large round bouffant skirt with rosettes and waxed orange blossom tucked into the pleated folds. 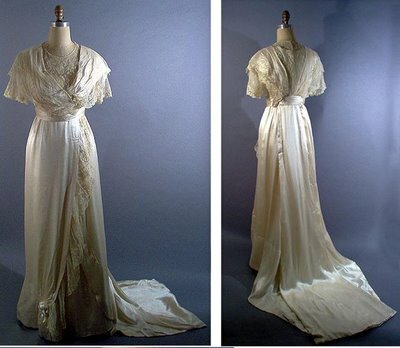 It was a gown that almost never was, as the original gown, which took two months to make, was ruined by a flood (along with the ten bridesmaid dresses) in the couturiere’s workroom ten days before the wedding and all of the gowns had to be re-created. My favorite part of Jackie’s bridal trousseau is her antique veil. She wore a Juliet cap cathedral length veil made of rosepoint lace and held by a tiara of lace and waxed orange blossoms. 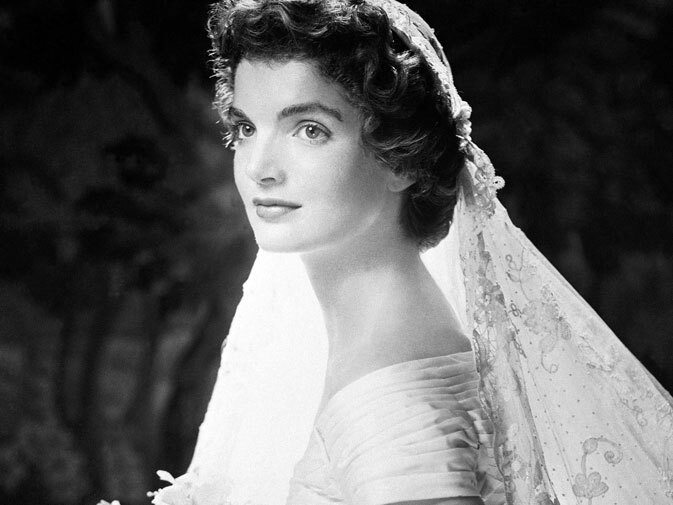 The veil is a family heirloom and was first worn by Jackie’s grandmother, Margaret Merritt Lee and then by her mother, Janet Lee Bouvier. 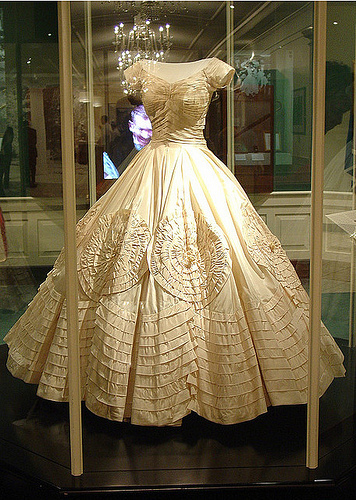 Jackie’s wedding gown is now housed at the JFK library in Boston. 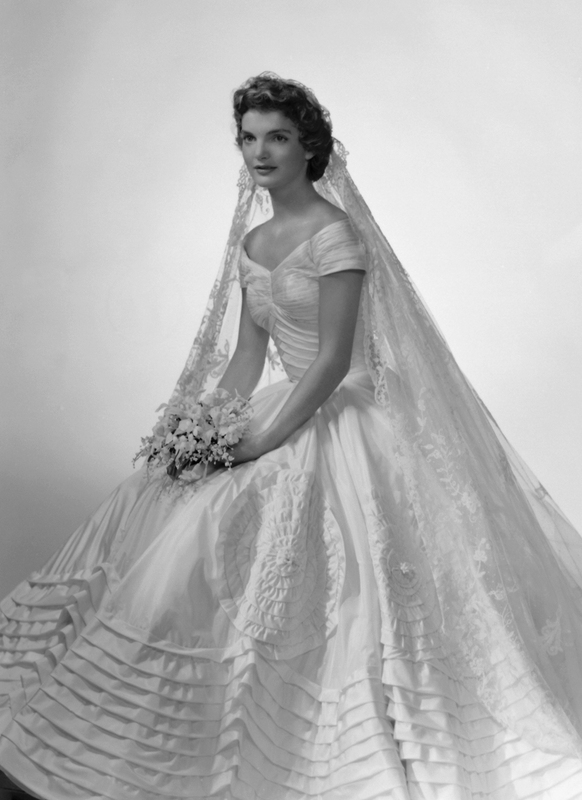 The black and white photos from 1953 do not do the gown as much justice as when you see the gown today in color. 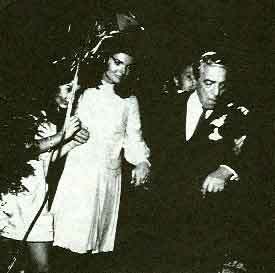 When Jackie married Aristotle Onassis on October 20, 1968 on the Greek island of Skorpios, she wore a gown that was more her personal style. Her Valentino creation was part of his famous White Collection and featured a pale beige bodice floating over a pleated skirt. It has been said that Jackie was the last fashion icon and although her style has often been imitated, she remains the ultimate stylista. What a conscientious lady Anne Lowe was for her & her staff to work practically around the clock to get Jackie’s dress and her bridesmaids’ dresses redone because of the flood 10 days before the wedding!! I read somewhere that her expected several hundred $$$ profit (a lot in 1953, I believe) turned into a few thousand $$$ loss. She was certainly a conscientious lady! 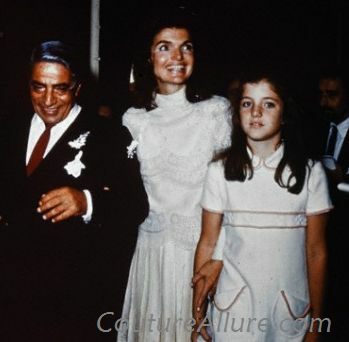 I wonder if she had any idea that she was clothing a future first lady? Independent couturier infusing history and antiquity into couture gowns and accouterments. Love my husband, our dogs, traveling, good food, Da Bears & beer. Content copyright 2010-2014 by Tanya Maile Hughes. 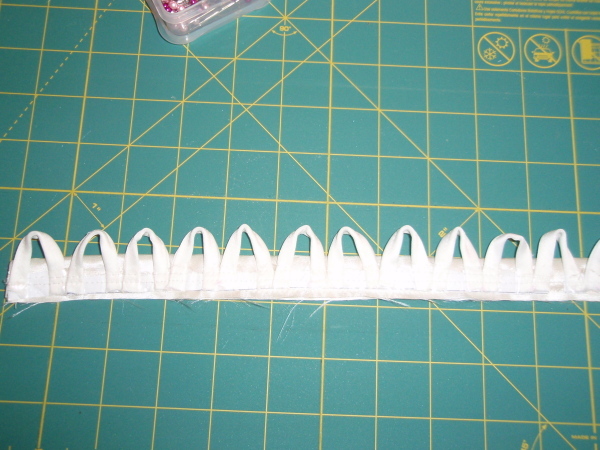 No part of the work displayed on this blog may be reproduced without the author's permission. Content copyright 2010-2014 by Tanya Maile Hughes. No part of the work displayed on this site may be reproduced without the author's permission.